To install the program, download and unzip the file, run the installation program, follow the instructions and enter the serial number sent after payment. An effective and easy-to-use photo editor that contains optimized and more sensitive photo editing tools, new project templates, text presets and gradient tools for quick visualization of creative concepts. New tools for creating screenshots will ensure the effective exchange of information. 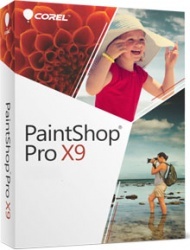 PaintShop Pro is the only non-subscription distributed solution for creating home and professional projects, combining the highest level of universality, productivity and cost-effectiveness. AI, BMP, CAL, CALS, CGM, CLP, CUR, CUT, DCX, DIB, EMF, EPS, GIF, HDP, IFF, IMG, J2C, J2K, JIF, JP2, JPC, JPE, JPEG, JPG, JPS, JPX, MAC, MPO, MRW, MSP, PBM, PCD *, PCT, PCX, PDF, PGM, PIC, PICT, PNG, PNS, PPM, PS, PSD, PSP (PSP image files), RAS, RAW, RIF, RLE, SCT, SVG, SVGZ, TGA, TIF, UFO, WBM, WBMP, WDP, WEBP, WMF, WPG **. The RAW format supports more than 450 camera models, including the following file extensions: 3FR, ARW, CR2, CRW, DCR, DNG, K25, KDC, NEF, NRW, ORF, PEF, RAF, RW2, SR2, SRF, X3F. * Supported only in 32-bit version. ** WPG (only vector images of WordPerfect) is not supported in the 64-bit version. WordPerfect raster images are supported in 64-bit version.